OVERLAND PARK, Kan. — One year ago, students at Blue Valley Middle School crafted up plans for a new card business. This year, they're already taking orders. "We sell cards so people can buy them and get them," said Robert Boyd, a sixth grader at Blue Valley Middle School. This school year, Robert is making cards of every kind. Holiday cards, birthday cards, thank you cards and more. It's part of what the students in the Intensive Resource and LIFT Program do at Blue Valley Middle School. 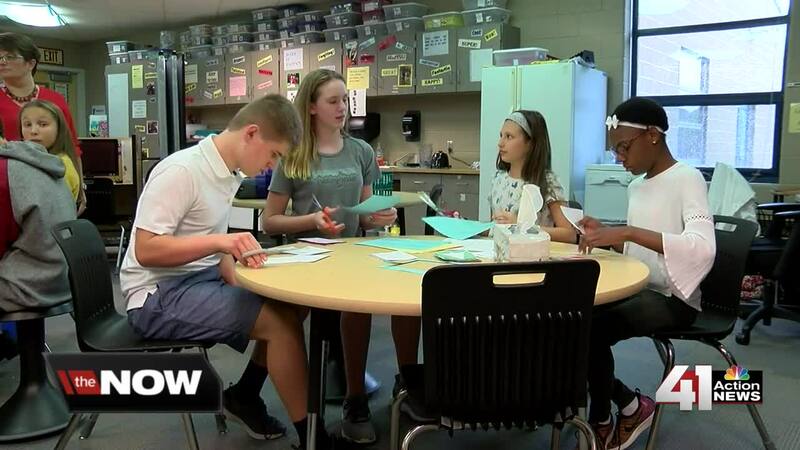 "We work on academics, we work on functional skills, we work on vocational skills," said Amy Zegers, Intensive Resource Teacher, Blue Valley Middle School. Mrs. Zegers class created Cardinal Cards last year. She said she was trying to come up with a business her students could start and learn from. Students in the class recycle paper scraps and turn them into decorative cards they then sell for $1. Last school year, the students sold nearly 200 cards. This year, the class has already filled more than 100 orders. "We spend a lot of time making them," said Boyd. Overall, Mrs. Zegers hopes the business helps prepare kids for life outside of school. "I want them to have the confidence that they know they can do something and create something that people like," said Zegers. The money the class makes from selling the cards goes back into making more. It also helps purchase supplies the class uses on a daily basis. To order cards, email Amy Zegers at Arzegers@bluevalleyk12.org or Jenn Buehler at Jbuehler02@bluevalleyk12.org.